It is a well known truth that a visually appealing and well designed web portal can contribute a lot to establish and sustain online presence of your business. Nobody can deny this fact that a full fledged website act as a face of your company, product or services in World Wide web and only medium which bridges gap between you and your potential clients. This makes a design and development of web portal more than necessity rather than a fad in order to get an informative and appealing site as well. However, an attractive web layout is not enough to catch attention of users and therefore, one needs PSD to XHTML conversion service for getting fully functional, user-friendly and highly SEO semantic cross browser compatible with W3C validated site. Earlier, PSD based files used to convert in HTML mark-up language but the results was not up to the mark like graphics get distorted and lots more. Then, the Extensible Hypertext Markup Language (XHTML) – an upgraded version of HTML come in use to ease down these transformation processes. 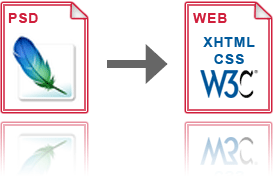 PSD to XHTML conversion requires lots of professional as well as technical skills along with knowledge of World Wide Web consortium (W3C) standards. Here, one needs to hire a XHTML web developer from web development company so that PSD based ordinary design get converted into high quality, pixel perfect, clean and easy-to-understand XHTML codes. In fact, PSD to XHTML is considered best option to get high speed optimized web portal.